VERITAS CENTRE DRAUGHT OIL LAMP, EMBOSSED BRASS BASE & FONT, CRANBERRY SHADE. STUNNING ANTIQUE VERITAS CENTRE DRAUGHT OIL LAMP This beautiful lamp stands 68cm tall to the top of the clear glass chimney. The base has a beautiful Art Nouveau embossed design. The column is in wood and finally fluted, the column finishes with a beaded top before the centre draught fitter to the base of the font. The font is stunning, again embossed with an Art Nouveau design to the lower part. The top of the font is stepped and this supports the Veritas centre draught burner which is in excellent condition. 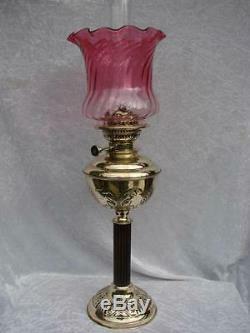 The lamp is complemented by a reproduction Victorian tulip shade in cranberry glass. A truly beautiful example sure to grace any interior. Please look carefully at the photographs and the condition report to satisfy yourself to condition and style. Thank you for looking and please view our other quality listings including many other oil lamps and oil lamp acceossories. We aim to sell quality authentic antiques and collectibles to the discerning customer. Please be sympathetic to the fact all of our items are used, sometimes for hundreds of years! International buyers please be aware that we only post. This is to ensure your item is delivered safely and in good time. For items weighing 2kg and over or large items we use. Parcel Force Worldwide Global Priority. This is a tracked service. We will provide a proof of posting certificate to support any personal claims you may initiate with the Post Office regarding your item should it be lost or damaged in transit. These charges are the buyers responsibility. Follow us on Instagram elimayboo_antiques to see exciting posts of our current listings. Certain images/photos incorporated into this template are the royalty free property of Karen's Whimsy Public Domain Images. Get Images that Make Supersized Seem Small. Auctiva's Listing Templates improve your auctions in minutes. Attention Sellers - Get Templates Image Hosting, Scheduling at Auctiva. The item "VERITAS CENTRE DRAUGHT OIL LAMP, EMBOSSED BRASS BASE & FONT, CRANBERRY SHADE" is in sale since Monday, February 29, 2016.